Afghanistan is proposing to offer top Taliban leaders exile if they agree to stop fighting under a peace deal in the works. Washington (CNN) -- Afghan President Hamid Karzai plans a peace "jirga" with tribal leaders later this month to discuss a reintegration plan for Taliban members who renounce violence and lay down their arms. But persuading the Taliban to do that -- and the process with which to accomplish it -- raises more questions than answers, experts said. "It's not clear whether there's a serious common ground between Karzai and his enemies," said Paul Staniland, who studies international security and insurgent groups at the Massachusetts Institute of Technology. "All of the reconciliation plans have been somewhat vague about what the ultimate end state is." Relations between Karzai and President Obama have been tense recently. In April, Karzai lashed out at foreign governments -- including the United States -- that demanded he clean up corruption within the government. In an eye-raising move, Karzai indicated that he'd be willing to join the Taliban. But a lot has changed in a month. On Wednesday, during a weeklong visit to the United States, Karzai made a 180-degree turn -- offering his support for Obama's plan in the war-torn region, including cleaning up government corruption and building up the Afghan police force as the United States looks to start removing troops by July 2011. "We are in a campaign against terrorism together," Karzai said. "There are days that we are happy; there are days that we are not happy. It's a mutual relationship towards a common objective." Obama has signaled that the United States is willing to support Karzai's reintegration plan, and said that part of getting the Taliban to renounce violence and make peace "depends on our effectiveness in breaking their momentum militarily." Richard Fontaine, a senior fellow at the nonpartisan Center for a New American Security, said the reality behind the renewed relations is to find a way to "hasten the successful conclusion of our war there." "And particularly after the experience in Iraq with tribes switching sides, I think there's a large appetite to see what's possible on the reintegration side," said Fontaine, who has worked as a foreign policy adviser to Sen. John McCain, R-Arizona. The idea of getting the Taliban to switch sides is nothing new. In October 2009, the president signed a $680 billion defense appropriations bill that included a plan to pay members of the Taliban to renounce violence and work with the Afghan government. The goal was to give U.S. commanders on the ground the ability to pick off low-level Taliban members. There has been an amnesty program for low-level Taliban in place for many years and thousands have taken advantage of it. Staniland, who contributes to Foreign Policy magazine, said he wouldn't be surprised if there were some low-level, back-channel communications going on between U.S. representatives and people linked in some way with the Taliban. "Formal negotiations or direct contact with the Taliban command structure is far less likely, but intermediaries and people claiming to have knowledge of the Taliban are plausible targets for informal U.S. engagement." Another question likely to come up in peace talks is what the Afghan government will give up in exchange for the Taliban giving up its power. 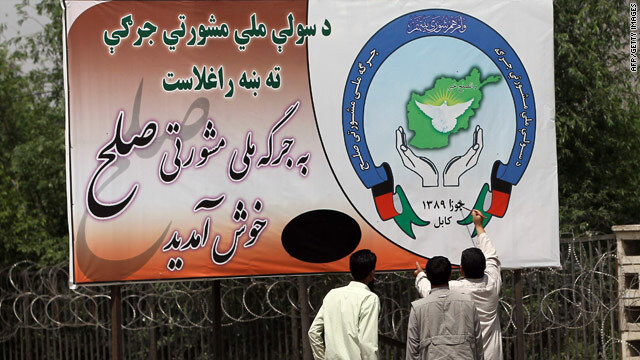 "Imagine the Taliban saying 'we want to share power in the central government.' That's not really something Karzai, or the U.S., is interested in," Staniland said. "On one hand, you want to flip over some of these guys and use them to break the Taliban," he added. "On the other hand, you also want to create a central government that has power [over] these places. So if you're giving power to defectors to break the Taliban, that means you're giving up some of the government's power in these [Taliban] areas." One thing the United States would unlikely be interested in: accepting the reintegration of radicals like Mullah Omar, the leader of the Taliban in Afghanistan. "I would think that Omar would be outside of our red lines in terms of people we would want to talk to about coming back in Afghanistan and the government," Fontaine said. Defense Secretary Robert Gates has said that having that conversation with Mullah Omar "would be pretty tough." There are questions about how Karzai's reintegration process would work. "The problem is that this is a complex and unpredictable process and we don't know which way it will go," a senior State Department official said. "He [Karzai] doesn't have a big program; there is no negotiating team yet. We are just starting to think about these political issues. When we say we want to support Afghan-led integration, we want to help them shape how it looks. "We will support a viable process, which means he has to have one," the official said. Part of that shaping process will be persuading the Taliban to back a centralized government and its human rights laws. "That has to mean an acceptance of all the Afghan Constitution, including its human rights provisions and everything else, because it cannot be anything like a return to the Taliban's social system that they had in place for 2001," said Fontaine. "The stated objective of the Taliban is to rework the nature of the Afghan government so it's based once again on Sharia law." It's a point Obama hammered home on Wednesday. "What we've said is that so long as there's a respect for the Afghan Constitution, rule of law, human rights; so long as they are willing to renounce violence and ties to al Qaeda and other extremist networks, that President Karzai should be able to work to reintegrate those individuals into Afghan society." Maryland Democratic Rep. Donna Edwards, just back from Afghanistan, said the reintegration process cannot exclude women's rights. "There has to be an agreement [by the Taliban] to adhere to the constitution and to renouncing violence and terrorism," she said. "And so you get those things and maybe a peace process can work, but I'm telling you with certainty, nothing will work if Afghan women aren't engaged, and so we can't have them thrown under the bus because we want to cut a deal with the tribal leaders and the Taliban." CNN Senior State Department Producer Elise Labott contributed to this report.